You’re starting to see them buzzing around. The wasps are back and they are busy starting to build nests on your home, in outdoor light fixture and any other place that is protected from the elements. Wasps and yellow jackets are beneficial insects. They feed their young on insects that would otherwise damage plants in your garden and around your home. They can also feed on house fly and blow fly larva! Each wasp nest is started by a single wasp and as it grows other wasps join the colony and reproduction begins. 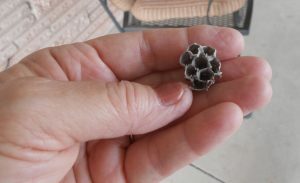 When those nests start to get large they are not only more difficult to get rid of, but the wasps also get fairly aggressive when the nest is disturbed. This is why right now is the time to handle them. When the nests are just starting to be built or are small, the wasps are not likely to be aggressive. If you walk around your home frequently and stay on top of it you can keep any large nests from developing in places on you home where you may come in close contact with them.